Product prices and availability are accurate as of 2019-04-17 22:24:11 EDT and are subject to change. Any price and availability information displayed on http://www.amazon.com/ at the time of purchase will apply to the purchase of this product. 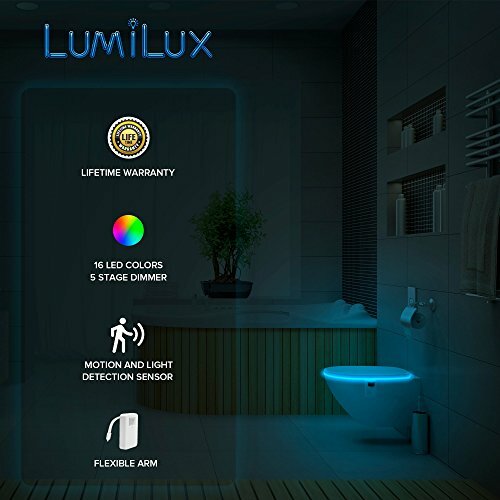 Advanced 16 Color Motion Sensor LED Toilet LightOne of the most advanced water-resistant toilet lights on the market, the LumiLux toilet light uses state-of the-art technology to create the perfect way to light up your toilet. 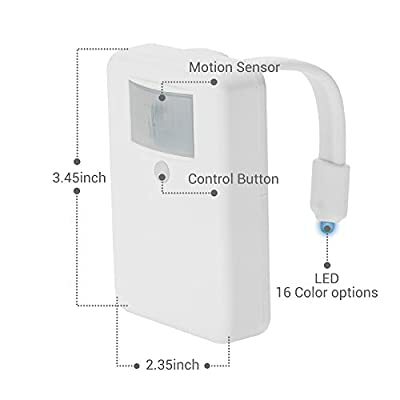 Select from 16 colors or create a rainbow in your bathroom using the carousel mode.Infrared Motion Sensor & Light Detection SensorThe built in infrared motion sensor detects body heat upon entry and will shut off upon exit. 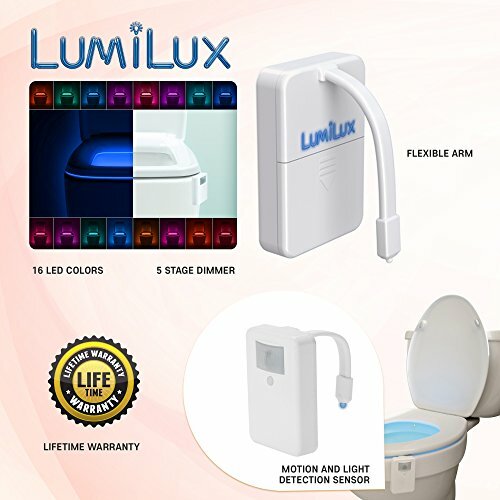 What also makes the LumiLux toilet light so advanced is the light detection sensor that will make sure the toilet light does not come during daytime or while the bathroom light is on.Battery Life & Lifetime WarrantyThe average battery life on the LumiLux Advanced LED Toilet Light is 6 months to 1 year, depending on the brightness setting (includes 5 levels) and frequency used. The light detection sensor deactivates the LED light the instant it detects light to maximize battery life. Requires 3 AA batteries (sold separately). Features a low battery indicatory: red LED light will blink 5x.The LumiLux Advanced LED Toilet Light comes with a lifetime warranty. If you ever experience issues with your toilet light, then we will replace it for free. Just contact us directly by going to Amazon > Your account > Your Orders > Leave seller feedback > view seller profile > ask question. Send us your order ID and we will take care of you within 24 hour. Warranty only valid if purchased by Upper Echelon Products. Size and FitThe LumiLux toilet light housing compartment measures approximately 3.5" x 2.5" x .75" with the flexible arm extending about 4" from the housing compartment. FCC and EMC Certified. MOTION AND LIGHT DETECTION SENSOR - The built in motion sensor detects body heat to automatically illuminate the room when you enter and shut off when you leave. The light detection sensor will deactivate the LED light the instant it detects light is on to maximize battery life. 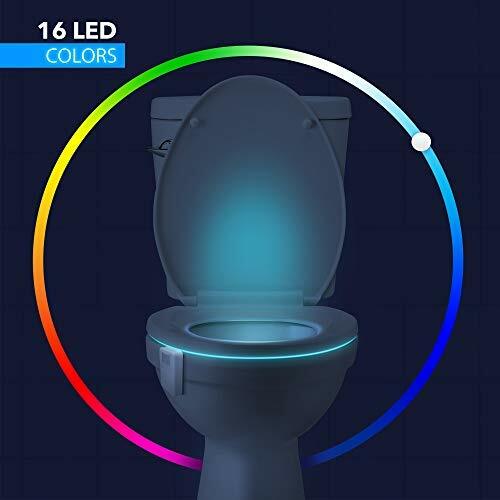 16 LED COLORS - You can choose a fixed color to fit your mood or choose carousel mode which will cycle seamlessly through every shade of color inside your toilet bowl when activated. Kids love the glowing water of their lighted potty! Colors include blue, teal, red, purple, indigo, green, yellow, amber, orange, white and more. FLEXIBLE ARM - The flexible arm can be bent to secure the unit for any size toilet bowl- resting just below the seat lid and onto the rim. The bendable arms provide a more secure fit than other toilet lights with cheap suction cups. 5 STAGE DIMMER - Make your toilet bowl nightlight glow as dark or bright as you want by selecting from up to 5 different levels of brightness. 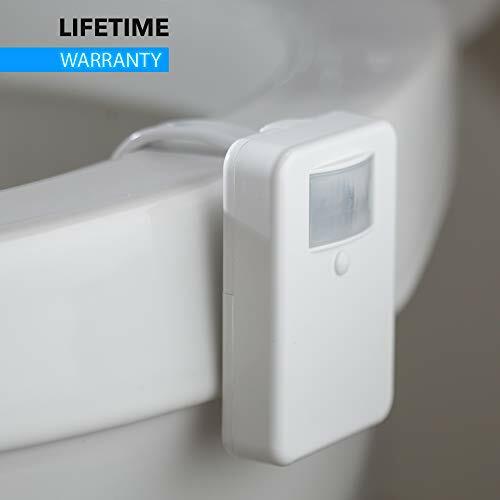 LIFETIME WARRANTY - LumiLux is your prime source for automatic, illuminated toilet bowl lights. If anything goes wrong with your Lumilux Toilet Night Light we will send you a new one absolutely free.